Ahmed Hussen, Immigration Minister has stated that by the year 2036 all population growth in Canada will happen owing to immigration. At present, it is 75 percent. He was tabling the bill in the House of Commons. Canada has decided to open up for nearly one million immigrants in the next three years. A multi-year strategy was listed by the Liberal government signaling a greatly ambitious immigration level in present history. The proposed immigration level of Canada year wise is 310,000 in 2018, 330,000 in 2019 and then moving up to 340,000 in 2020. There is a specific target for economic migrants, refugees, and family members. The outcome of these new targets will increase the ratio of immigrants in the population and help it to reach one percent by the year 2020. This will go a long way to offset an aging demography. The plan was at once historic, responsible and ambitious. He said that the government firmly believes that all newcomers play a fundamental role in the society. 5 million Countrymen would retire by 2035 and there are people in small numbers who work to support senior citizens and retired persons. In 1971 the number of people of working age for each senior was 6.6, and by 2012 it dropped to 4.2. Projections now show it will be only 2 to 1 by the year 2036. 100 percent of population growth will happen owing to immigration. At present immigration was the force behind innovation and strengthening of the economy. The newcomers are not a drain or a burden on the resources and society he added. The government was taking effective steps to reduce backlogs and hasten the application processing to reunite families and complete the formalities of citizenship applications. It had adopted a gradual approach to successful integration. The Advisory Council on Economic Growth of the federal government had proposed increasing the level to 450,000 newcomers by 2021. To arrive at the figures announced he had consulted all stakeholders who were in favour of an increase but had also wanted that the newcomers to Canada were given required tools to succeed after arriving here. A Conservative critic, Michelle Rempel, said that the government should do a superior job in integrating all newcomers. The government had tabled about the number of people to welcome and was publicizing the achievements about numbers of refugees, and the money spent, on them. The loophole in the Safe Third Country Agreement, which helped the migrants to move to Canada through unofficial border crossings to lay a claim for refugee status, should be closed. The system should help immigrants to integrate through language efficiency. Proper mental health support should be planned for trauma victims. Dory Jade, CEO, Canadian Association of Immigration Consultants, and The Canadian Council of Refugees greeted the development and suggested that the numbers might have been higher. 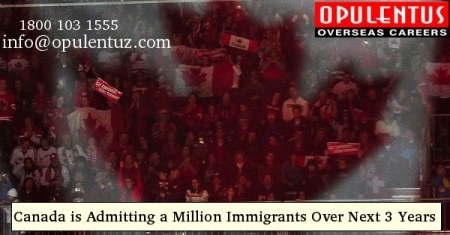 Canada would prosper if it had 350,000 immigrants. Laura Albanese, Immigration Minister Ontario said that the province was in favour of introducing multi-year levels plans to provide predictability to the system and help in program planning. Variations in yearly immigration levels can impact the requirement for provincial resources yearly. A long-term outlook will help in proper planning for use of service levels and resources. The Canadian Immigrant Settlement Sector Alliance had presented a Vision statement for 2020, calling for a bold three-year plan to tackle the demographic shifts in the country. It had viewed increased numbers as good in the economic, refugee and family categories. Chris Friesen, Director of Settlement Services, wanted a white paper or royal commission on the issue for developing a wide-ranging approach regarding future immigration. He said that the impact of automation and technology added with immigration will be heavy and grow in reply to an aging population, diminishing birth rate, and more retirements. With these developments, Canada Immigration is the need of the hour and one can migrate to Canada, to reap the benefits of this liberal policy. PR Visa to Canada will be achieved by proper guidance and we are ready to help out in this regard. Express Entry Immigration to Canada is the ideal route to be taken in this scenario.